Recipe submitted by Allison Wrobel, Associate Brand Manager, Cadbury Schweppes Americas Beverages. Gazpacho is served chilled, which makes it perfect for a summer meal starter. 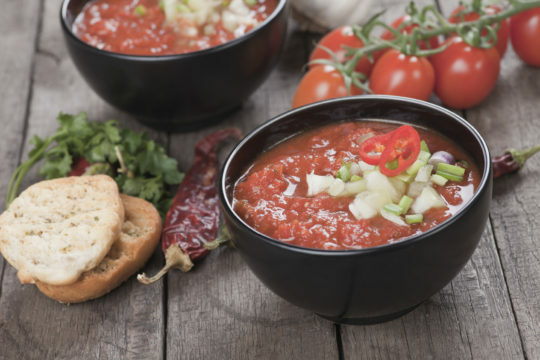 This cold tomato-based soup is low in calories and almost fat-free. Include peppers and other seasonings in the soup too. Process all ingredients together until soup is the desired texture. Garnish with chopped bell peppers, cucumber, whole basil leaves, red onion, parsley and green jalapeno. This recipe makes 6 (1 cup) servings.